Coenraad De Buys, born in 1761, was a rebel and an outlaw in the old Cape Colony. By all accounts Coenraad was an exceptionally tall man and an impressive figure. He was one of a number of white and coloured people (such as Hermanus ‘Ngxukumeshe’ Matroos and Hans Branders) who were on the Xhosa side in the frontier wars against the Boers and then the British. On 20 Sept 1799, Dr Johannes Van Der Kemp, a missionary from the London Missionary Society, met Coenraad De Buys in Kaffirland, where Coenraad acted as interpreter for van Der Kemp with Gaika. Over that year and the next Coenraad and Dr Van Der Kemp's friendship grew. At the end of 1800 Coenraad and Van Der Kemp decided to fight their way through the “Eastern Bosjesmen” - probably those near the Stormbergen -in order to find a new country. In the first days January of 1801, they were to cross the Kabusie river, the first stage of their trek. 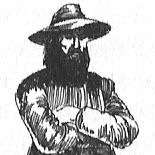 Van der Kemp was washed away by the strong river and nearly drowned in crossing, but Coenraad took a few strides towards Van Der Kemp and plucked him out of the river basically without getting himself wet. Coenraad must have been a really huge, strong man. Coenraad did, however, end up very frail and weak towards the end, and even suffered a stroke which left him paralyzed on one side of his body. I would love to sit down at a camp fire with Ou Coen and drink some of his old Cape Brandy (which was thick and muddy) and talk to him about his times and see what he thinks of today's South Africa and what has become of his people.